Dropbox is a one among the best online file syncing tool available out there. And unlike Ubuntu One, my other favorite file syncing tool, Dropbox is cross platform as well. 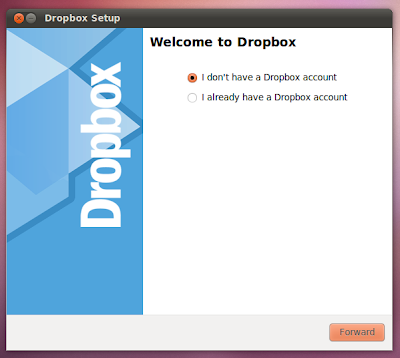 So here is how you install Dropbox in Ubuntu 10.04 "Lucid Lynx" and Ubuntu 10.10 "Maverick Meerkat". Download Dropbox Nautilus client first. Both 32bit and 64bit versions of the DEB file are available. Download Dropbox. Double-click on the downloaded file to install it. 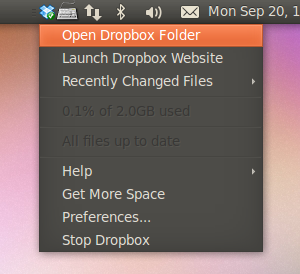 Remember, while you install Dropbox in your Ubuntu, automatically a new Dropbox repo is added to your sources.list. That will come in handy for future Dropbox updates. 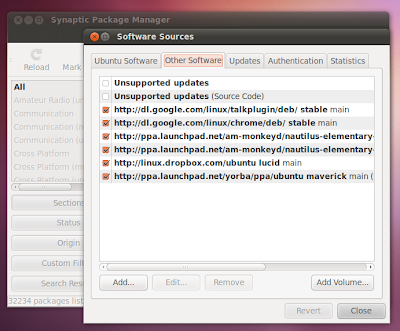 As you can see, it shows "lucid" instead of "maverick"(since I am using ubuntu 10.10 beta). So I am not sure if the updates are going to work in Ubuntu 10.10 with this 'Lucid' Dropbox repo. But the Dropbox client is definitely working fine in my Ubuntu 10.10 beta. You must be prompted with an option to restart Nautilus by now. Restart Nautilus and then launch Dropbox. Applications - Internet - Dropbox. And you will be asked to download a 'proprietary daemon'. See screenshot. 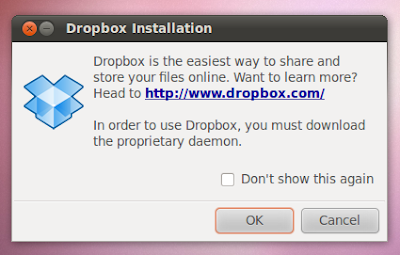 Click OK to download Dropbox daemon. After downloading is done, you will be prompted with an option to 'sign up with Dropbox'. If you haven't signed up with Dropbox yet and if you are interested in an offer for 250MB of free extra storage from Dropbox, you may visit the 'PS' section below post. Otherwise, just go through the steps by clicking 'Forward'. After finishing the installation process, you will notice a new Dropbox icon on your top panel. You can use it as your launchpad for all Dropbox related needs. Done. Though Dropbox is an awesome file syncing tool, I will never recommend syncing your very personal stuff in some server cloud. Otherwise, it's just cool. PS: Dropbox has an open offer now where in, if you refer somebody through the referral link provided by Dropbox, both you and the person joined will get an extra 250MB free disk space. "For every friend who joins Dropbox, we'll give you both 250 MB of bonus space (up to a limit of 8 GB)!". So if you are interested, here is my referral link for Dropbox signup.